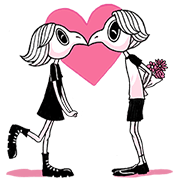 http://www.line-stickers.com/ – JANE & JOHNNY Line Sticker | Jane and Johnny are a peculiar bird-human hybrid couple who live quite normal lives, loving and fighting each other. Available till January 6, 2015. Next post Cʹmon! Kara Mucho Stickers!